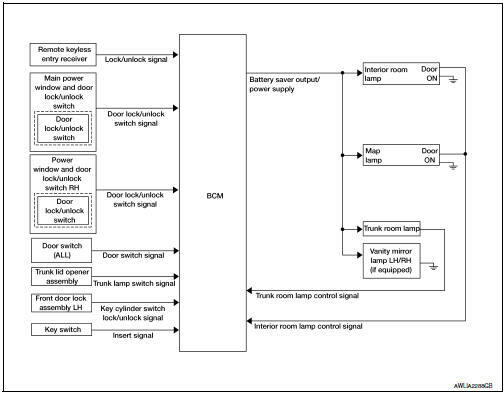 Interior room lamp* is controlled by the interior room lamp timer control function of the BCM. Trunk room lamp is controlled by the trunk room lamp control function of the BCM. The timer control functions of the BCM activate based on inputs from the key cylinder lock/unlock switch LH, the door switches, the key switch and door lock/unlock switches. *Interior room lamp and map lamp (when lamp switch is in DOOR position). 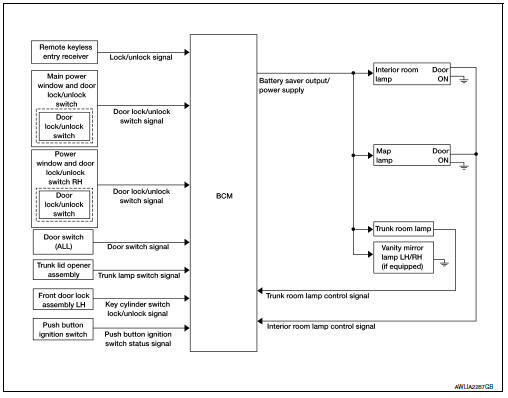 When the interior room lamp switch is in the DOOR position and when all conditions below are met, the BCM begins timer control (maximum 30 seconds) for interior room lamp ON/OFF. When the front door LH is unlocked with key fob, main power window and door lock/unlock switch, power window and door lock/unlock switch RH or front door lock assembly LH (key cylinder switch). When a door opens → closes and the push-button ignition switch is not pressed (with Intelligent Key). When a door opens → closes and the key is not inserted in the ignition switch (without Intelligent Key). Timer control is cancelled under the following conditions. When the front door LH is locked with key fob, main power window and door lock/unlock switch, power window and door lock/unlock switch RH or front door lock assembly LH (key cylinder switch). A door is opened (door switch turns ON). Ignition switch is turned ON. Interior lamp operational settings can be changed with the function setting of CONSULT. If an interior lamp is left ON and does not turn OFF even when the doors are closed, the BCM turns off power to the interior lamps automatically to save the battery 10 minutes after the ignition switch is turned OFF. The BCM controls power and ground to all interior lamps. the key is removed from or inserted into the ignition switch (without Intelligent Key). The interior lamp battery saver control time period can be changed with the function setting of CONSULT. The illumination lamps operation is dependent upon the position of the combination switch (lighting and turn signal switch). When the combination switch (lighting and turn signal switch) is placed in the AUTO (if equipped and activated) or parking lamp position the BCM (body control module) receives input requesting the parking lamps to illuminate. This input is communicated to the IPDM E/R (intelligent power distribution module engine room) via the CAN communication lines. The CPU (central processing unit) of the IPDM E/R controls the tail lamp relay coil. When energized, this relay directs power to the parking and illumination lamps, which then illuminate. When the combination switch (lighting and turn signal switch) is in the AUTO (if equipped and activated) or parking lamp position and the ignition switch is turned from ON or ACC to OFF, the battery saver control feature is activated. Under this condition, the illumination lamps remain illuminated for 10 minutes unless the combination switch (lighting and turn signal switch) position is changed. If the combination switch (lighting and turn signal switch) position is changed, then the illumination lamps are turned off after a 30 second delay. When the combination switch (lighting and turn signal switch) is turned from OFF to AUTO (if equipped and activated) or parking lamp position after illumination lamps have been turned off by the battery saver control, the illumination lamps illuminate again.